I used a basic vanilla cupcake which is always a winner. 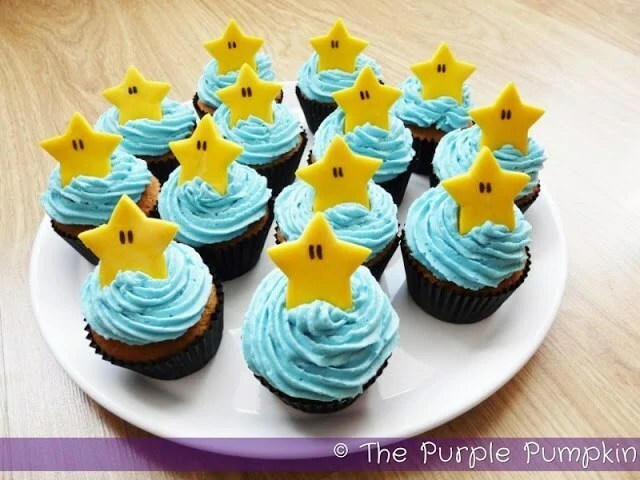 The recipe gives enough for 18 cupcakes, but as I was only making 13, I used the leftover batter to make mini Starman cakes. The cupcake recipe is so easy – everything into a bowl and whisked together until smooth! Then spooned into cupcake cases and baked until risen and golden. To decorate the cupcakes I made some butter icing and coloured it blue. I then piped swirls on top of each one. To make the Starman toppers, I bought some ready coloured yellow sugar paste (fondant), rolled it out (dusted with icing sugar to stop it sticking) and cut star shapes out with a cookie cutter. I then used a black food pen and drew on some eyes. To get rid of excess icing sugar, you can brush it off, or give a light misting of vodka (I put it in a spray bottle). Vodka dries quicker than water, which is why I use it! However, I completely forgot to do this before putting the eyes on, and didn’t want to risk the food colour running, so I just brushed it off as best I could with a clean, unused, paint brush. My son loved them! I loved how they turned out and everyone agreed that they tasted great! Place 24 cupcake cases into tins. Put all of the ingredients into a mixing bowl and beat with an electric whisk for 3 minutes until smooth, pale and fluffy. Leave to cool in the tin for a few minutes and then transfer to a wire rack to cool completely before decorating. Add the softened butter to a large mixing bowl and beat with an electric mixer. Slowly sift in the icing sugar until combined. Whisk in the milk (or lemon juice) and vanilla extract. Then add a few drops of food colouring at a time to get the desired shade. Add some food glitter to the mix too. You should find that the buttercream will form stiff(ish!) peaks and can be used in a piping bag. Only decorate the cupcakes when they are completely cool. Place some of the buttercream icing into a piping bag with a star nozzle attached (don't overfill the bag) and pipe a swirl on top of each cupcake. Sprinkle with more food glitter or sprinkles. Add a topper if desired.